When one considers that the Series 3 V12 models were still produced for much of the XJ40 period, the initial range of new models was comprehensive for Jaguar at this time. 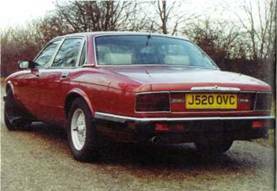 The XJ6 models were effectively the base models of the range. Indeed, the 2.9-litre was offered at a price of just over £16,000 (cheaper than any Jaguar produced since 1983) in an attempt to enter the management fleet market. In neither engine size these cars did not feature such luxuries as leather upholstery, air conditioning, alloy wheels, ABS, or automatic transmission within the basic price. You did, however, get an on-board computer, the then entirely new Vehicle Condition Monitor, and a five-speed manual gearbox. The Sovereign models were aimed fairly and squarely at traditional Jaguar customers, usually businessmen with a company-supplied vehicle. Better equipped than the outgoing Series 3 Sovereign models, you got ABS, rear ride height adjustable suspension, eight-way electrically adjustable front seats, and six-speaker hi-fi radio/cassette system. That was on top of the usual Sovereign equipment, such as air conditioning, headlight wash/wipe, cruise control, on-board computer, etc. The one things you still had to pay extra for initially were alloy wheels. ... whereas top of the range cars from 1990 featured chrome surrounds to rear lights and enhanced boot chromes. The Daimler was the most expensive and therefore top of the range vehicle, built to the usual standards by Jaguar with fluted external trim treatment and different shaping to the seating. 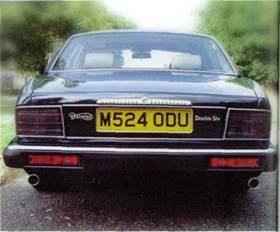 The Sovereign and Daimler models, although utilising the same bodyshell as the XJ6s, had a different frontal lighting treatment which instantly differentiates them. 4.0-litre Sovereigns are identified by the extra chrome on the boot area and, normally, lattice style alloy wheels. Manual and automatic transmission were offered throughout the range, the latter utilising a new 'J-gate' control quadrant, unique to Jaguar and still used to this day. This allowed a certain degree of manual control over intermediate gears. Apart from the usual minor changes and manufacturing modifications, the range ran virtually unaltered until 1988, when a new car appeared, the XJR. Based on the 3.6-litre model, this vehicle was enhanced by the JaguarSport company at its Oxfordshire premises. According to customer requirements, the model received a new exterior paint finish, body styling kit, mechanically better brakes, stiffer suspension, and even improved engine manifolding. In 1990 the conventional production models started to change when the larger-engined cars were substantially upgraded. A new 4.0-litre version of the AJ6 power unit was adopted for this model, which brought with it improved midrange torque. Stylistically the car gained more chrome and internally the previous all-electronic dashboard was replaced by analogue instrumentation. The same interior treatment took effect on the last of the 2.9-litre models, which were also mechanically upgraded from 1991 with the complete replacement of this engine by a 3.2 single cam unit based on the larger twin cam engines. The later engine offered greater smoothness with enhanced performance. Up to 1990 allXJ40s featured a digitised instrument binnacle as depicted here. 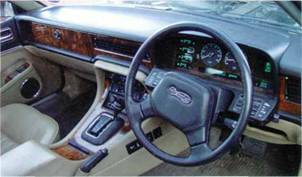 This picture also shows the original style of steering wheel, prior to the fitment of air bags from 1992. Regular updates appeared each model year but it wasn't until 1993 that another new model appeared in the XJ40 range. For the first time two V12-engined cars were offered, one a Jaguar XJ12 and the other a Daimler Double Six. Equipped similarly to the Sovereign and Daimler models, there were subtle differences (see details below). The V12 engine had been significantly improved, now of 6.0 litres capacity and 318bhp. By this time the XJ40 was the only saloon model available from Jaguar, the very last Series 3 having left the factory at the end of 1992. Analogue instruments appeared in 1990 for all models. At the end of 1993 Jaguar announced yet another XJ40 model, the Sport, or 'S' as it became known. Trying desperately to cater for a younger market the S models (only available in six-cylinder engine form) offered colour coordinated exterior trim to the body, five-spoke alloy wheels, and revised interior trim, including rosewood instead of walnut veneer. A few long wheelbase Majestic models of the XJ40 were also produced to special order, although this was never considered a proper production model. 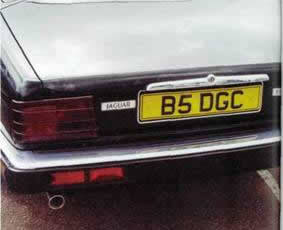 This appeared in 1994, as did the final new XJ40 model, called the Gold. Based on the standard XJ6 3.2-litre model, a special reduced exterior colour range, gold plated badge on the boot, and a mix of interiors between standard and S, and offered at a modest price, the Gold allowed Jaguar to recapture lost sales in the XJ40's final twelve months. Sales of all XJ40 models in 1994 only accounted for just over 10,000 vehicles, less than half the previous year, mostly due to public knowledge that a replacement model (the X-300) would be arriving soon. At various times other options for XJ40 models were considered, such as a short wheelbase two-door coupe and a five-door estate car, both of which didn't progress beyond driving prototype stages. Carriage trade manufacturers also completed a number of stretched limousines, both four- and six-door variants, based on the XJ40 design, as well as hearse bodies. The US range of XJ40 models also changed year by year, although it never received the base model XJ6s. The names Vanden Plas and Majestic were resurrected for special top of the range (Daimler equivalent) models at various times, also for the US market only.